Hey guys, welcome to Frugalicious Friday! So excited to see your creative projects this week! 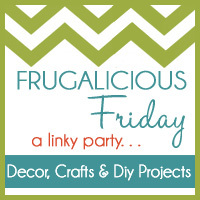 If your new here this linky party is all about linking up your fabulous, thriftiest...most frugalicious home decor finds, crafts, recipes & Diy projects! If you've still got questions click here. No Giveaway today, but let's keep this thrifty par-tay going anyway and market your projects! So link up and give us the scoop on how you find fabulous...for less. You know what I'm so excited about Jane, thanks for hosting! Thanks for linking up guys, can't wait to surf all the links!! Oh and check back next week! We've got a great Giveaway. Win a $50 gift certificate to the one and only....West Elm! !